Not to be confused with Glycogenesis or Glyceroneogenesis. Gluconeogenesis (GNG) is a metabolic pathway that results in the generation of glucose from certain non-carbohydrate carbon substrates. From breakdown of proteins, these substrates include glucogenic amino acids (although not ketogenic amino acids); from breakdown of lipids (such as triglycerides), they include glycerol, odd-chain fatty acids (although not even-chain fatty acids, see below); and from other steps in metabolism they include pyruvate and lactate. Gluconeogenesis is one of several main mechanisms used by humans and many other animals to maintain blood glucose levels, avoiding low levels (hypoglycemia). Other means include the degradation of glycogen (glycogenolysis) and fatty acid catabolism. Gluconeogenesis is a ubiquitous process, present in plants, animals, fungi, bacteria, and other microorganisms. In vertebrates, gluconeogenesis takes place mainly in the liver and, to a lesser extent, in the cortex of the kidneys. In ruminants, this tends to be a continuous process. In many other animals, the process occurs during periods of fasting, starvation, low-carbohydrate diets, or intense exercise. The process is highly endergonic until it is coupled to the hydrolysis of ATP or GTP, effectively making the process exergonic. For example, the pathway leading from pyruvate to glucose-6-phosphate requires 4 molecules of ATP and 2 molecules of GTP to proceed spontaneously. 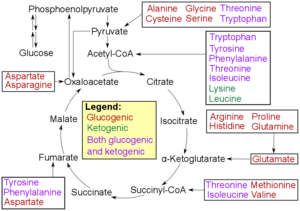 Gluconeogenesis is often associated with ketosis. Gluconeogenesis is also a target of therapy for type 2 diabetes, such as the antidiabetic drug, metformin, which inhibits glucose formation and stimulates glucose uptake by cells. In ruminants, because dietary carbohydrates tend to be metabolized by rumen organisms, gluconeogenesis occurs regardless of fasting, low-carbohydrate diets, exercise, etc. Ketogenic amino acids do not. These products may still be used for ketogenesis or lipid synthesis. Some amino acids are catabolized into both glucogenic and ketogenic products. In humans the main gluconeogenic precursors are lactate, glycerol (which is a part of the triacylglycerol molecule), alanine and glutamine. Altogether, they account for over 90% of the overall gluconeogenesis. Other glucogenic amino acids as well as all citric acid cycle intermediates, the latter through conversion to oxaloacetate, can also function as substrates for gluconeogenesis. In ruminants, propionate is the principal gluconeogenic substrate. In nonruminants, including human beings, propionate arises from the β-oxidation of odd-chain and branched-chain fatty acids is a (relatively minor) substrate for gluconeogenesis. Generally, consumption of gluconeogenic substrates in food does not result in increased gluconeogenesis..
Lactate is transported back to the liver where it is converted into pyruvate by the Cori cycle using the enzyme lactate dehydrogenase. Pyruvate, the first designated substrate of the gluconeogenic pathway, can then be used to generate glucose. Transamination or deamination of amino acids facilitates entering of their carbon skeleton into the cycle directly (as pyruvate or oxaloacetate), or indirectly via the citric acid cycle. The contribution of Cori cycle lactate to overall glucose production increases with fasting duration. Specifically, after 12, 20, and 40 hours of fasting by human volunteers, the contribution of Cori cycle lactate to gluconeogenesis was 41%, 71%, and 92%, respectively. Whether even-chain fatty acids can be converted into glucose in animals has been a longstanding question in biochemistry. It is known that odd-chain fatty acids can be oxidized to yield propionyl-CoA, a precursor for succinyl-CoA, which can be converted to pyruvate and enter into gluconeogenesis. In plants, specifically seedlings, the glyoxylate cycle can be used to convert fatty acids (acetate) into the primary carbon source of the organism. 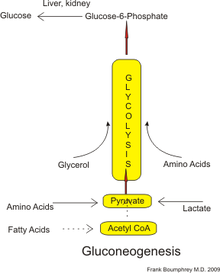 The glyoxylate cycle produces four-carbon dicarboxylic acids that can enter gluconeogenesis. In 1995, researchers identified the glyoxylate cycle in nematodes. In addition, the glyoxylate enzymes malate synthase and isocitrate lyase have been found in animal tissues. Genes coding for malate synthase have been identified in other metazoans including arthropods, echinoderms, and even some vertebrates. Mammals found to possess these genes include monotremes (platypus) and marsupials (opossum) but not placental mammals. Genes for isocitrate lyase are found only in nematodes, in which, it is apparent, they originated in horizontal gene transfer from bacteria. The existence of glyoxylate cycles in humans has not been established, and it is widely held that fatty acids cannot be converted to glucose in humans directly. However, carbon-14 has been shown to end up in glucose when it is supplied in fatty acids. Despite these findings, it is considered unlikely that the 2-carbon acetyl-CoA derived from the oxidation of fatty acids would produce a net yield of glucose via the citric acid cycle – however, acetyl-CoA can be converted into pyruvate and lactate through the ketogenic pathway. Put simply, acetic acid (in the form of acetyl-CoA) is used to partially produce glucose; acetyl groups can only form part of the glucose molecules (not the 5th carbon atom) and require extra substrates (such as pyruvate) in order to form the rest of the glucose molecule. But a roundabout pathway does lead from acetyl-coA to pyruvate, via acetoacetate, acetone, hydroxyacetone (acetol) and then either propylene glycol or methylglyoxal. In mammals, gluconeogenesis has been believed to be restricted to the liver, the kidney, the intestine, and muscle, but recent evidence indicates gluconeogenesis occurring in astrocytes of the brain. These organs use somewhat different gluconeogenic precursors. The liver preferentially uses lactate, glycerol, and glucogenic amino acids (especially alanine) while the kidney preferentially uses lactate, glutamine and glycerol. Lactate from the Cori cycle is quantitatively the largest source of substrate for gluconeogenesis, especially for the kidney. The liver uses both glycogenolysis and gluconeogenesis to produce glucose, whereas the kidney only uses gluconeogenesis. After a meal, the liver shifts to glycogen synthesis, whereas the kidney increases gluconeogenesis. The intestine uses mostly glutamine and glycerol. Propionate is the principal substrate for gluconeogenesis in the ruminant liver, and the ruminant liver may make increased use of gluconeogenic amino acids, e.g. alanine, when glucose demand is increased. The capacity of liver cells to use lactate for gluconeogenesis declines from the preruminant stage to the ruminant stage in calves and lambs. In sheep kidney tissue, very high rates of gluconeogenesis from propionate have been observed. In all species, the formation of oxaloacetate from pyruvate and TCA cycle intermediates is restricted to the mitochondrion, and the enzymes that convert Phosphoenolpyruvic acid (PEP) to glucose-6-phosphate are found in the cytosol. The location of the enzyme that links these two parts of gluconeogenesis by converting oxaloacetate to PEP – PEP carboxykinase (PEPCK) – is variable by species: it can be found entirely within the mitochondria, entirely within the cytosol, or dispersed evenly between the two, as it is in humans. Transport of PEP across the mitochondrial membrane is accomplished by dedicated transport proteins; however no such proteins exist for oxaloacetate. Therefore, in species that lack intra-mitochondrial PEPCK, oxaloacetate must be converted into malate or aspartate, exported from the mitochondrion, and converted back into oxaloacetate in order to allow gluconeogenesis to continue. Gluconeogenesis pathway with key molecules and enzymes. Many steps are the opposite of those found in the glycolysis. Gluconeogenesis is a pathway consisting of a series of eleven enzyme-catalyzed reactions. The pathway will begin in either the liver or kidney, in the mitochondria or cytoplasm of those cells, this being dependent on the substrate being used. Many of the reactions are the reverse of steps found in glycolysis. Gluconeogenesis begins in the mitochondria with the formation of oxaloacetate by the carboxylation of pyruvate. This reaction also requires one molecule of ATP, and is catalyzed by pyruvate carboxylase. This enzyme is stimulated by high levels of acetyl-CoA (produced in β-oxidation in the liver) and inhibited by high levels of ADP and glucose. Oxaloacetate is reduced to malate using NADH, a step required for its transportation out of the mitochondria. Malate is oxidized to oxaloacetate using NAD+ in the cytosol, where the remaining steps of gluconeogenesis take place. Oxaloacetate is decarboxylated and then phosphorylated to form phosphoenolpyruvate using the enzyme PEPCK. A molecule of GTP is hydrolyzed to GDP during this reaction. The next steps in the reaction are the same as reversed glycolysis. However, fructose 1,6-bisphosphatase converts fructose 1,6-bisphosphate to fructose 6-phosphate, using one water molecule and releasing one phosphate (in glycolysis, phosphofructokinase 1 converts F6P and ATP to F1,6BP and ADP). This is also the rate-limiting step of gluconeogenesis. Glucose-6-phosphate is formed from fructose 6-phosphate by phosphoglucoisomerase (the reverse of step 2 in glycolysis). Glucose-6-phosphate can be used in other metabolic pathways or dephosphorylated to free glucose. Whereas free glucose can easily diffuse in and out of the cell, the phosphorylated form (glucose-6-phosphate) is locked in the cell, a mechanism by which intracellular glucose levels are controlled by cells. The final reaction of gluconeogenesis, the formation of glucose, occurs in the lumen of the endoplasmic reticulum, where glucose-6-phosphate is hydrolyzed by glucose-6-phosphatase to produce glucose and release an inorganic phosphate. Like two steps prior, this step is not a simple reversal of glycolysis, in which hexokinase catalyzes the conversion of glucose and ATP into G6P and ADP. Glucose is shuttled into the cytoplasm by glucose transporters located in the endoplasmic reticulum's membrane. While most steps in gluconeogenesis are the reverse of those found in glycolysis, three regulated and strongly endergonic reactions are replaced with more kinetically favorable reactions. Hexokinase/glucokinase, phosphofructokinase, and pyruvate kinase enzymes of glycolysis are replaced with glucose-6-phosphatase, fructose-1,6-bisphosphatase, and PEP carboxykinase/pyruvate carboxylase. These enzymes are typically regulated by similar molecules, but with opposite results. For example, acetyl CoA and citrate activate gluconeogenesis enzymes (pyruvate carboxylase and fructose-1,6-bisphosphatase, respectively), while at the same time inhibiting the glycolytic enzyme pyruvate kinase. This system of reciprocal control allow glycolysis and gluconeogenesis to inhibit each other and prevents a futile cycle of synthesizing glucose to only break it down. The majority of the enzymes responsible for gluconeogenesis are found in the cytosol; the exceptions are mitochondrial pyruvate carboxylase and, in animals, phosphoenolpyruvate carboxykinase. The latter exists as an isozyme located in both the mitochondrion and the cytosol. The rate of gluconeogenesis is ultimately controlled by the action of a key enzyme, fructose-1,6-bisphosphatase, which is also regulated through signal transduction by cAMP and its phosphorylation. Global control of gluconeogenesis is mediated by glucagon (released when blood glucose is low); it triggers phosphorylation of enzymes and regulatory proteins by Protein Kinase A (a cyclic AMP regulated kinase) resulting in inhibition of glycolysis and stimulation of gluconeogenesis. Insulin counteracts glucagon by inhibiting gluconeogenesis. Type 2 diabetes is marked by excess glucagon and insulin resistance from the body. Insulin can no longer inhibit the gene expression of enzymes such as PEPCK which leads to increased levels of hyperglycemia in the body. The anti-diabetic drug metformin reduces blood glucose primarily through inhibition of gluconeogenesis, overcoming the failure of insulin to inhibit glucogeneogenesis due to insulin resistance. Studies have shown that the absence of hepatic glucose production has no major effect on the control of fasting plasma glucose concentration. Compensatory induction of gluconeogenesis occurs in the kidneys and intestine, driven by glucagon, glucocorticoids, and acidosis. ^ Silva, Pedro. "The Chemical Logic Behind Gluconeogenesis". Archived from the original on August 26, 2009. Retrieved September 8, 2009. ^ David L Nelson; Michael M Cox (2000). Lehninger Principles of Biochemistry. USA: Worth Publishers. p. 724. ISBN 978-1-57259-153-0. ^ Young JW (1977). "Gluconeogenesis in cattle: significance and methodology". J. Dairy Sci. 60 (1): 1–15. doi:10.3168/jds.S0022-0302(77)83821-6. PMID 320235. ^ a b Beitz, D. C. 2004. Carbohydrate metabolism. In: Reese, W. O. Dukes' physiology of domestic animals. 12th ed. Cornell Univ. Press. pp. 501–15. ^ Ferrier, Denise R; Champe, Pamela C; Harvey, Richard A (1 August 2004). "20. Amino Acid Degradation and Synthesis". Biochemistry (Lippincott's Illustrated Reviews). Hagerstwon, MD: Lippincott Williams & Wilkins. ISBN 978-0-7817-2265-0. ^ a b c d Gerich JE, Meyer C, Woerle HJ, Stumvoll M (2001). "Renal gluconeogenesis: Its importance in human glucose homeostasis". Diabetes Care. 24 (2): 382–91. doi:10.2337/diacare.24.2.382. PMID 11213896. ^ a b c Garrett, Reginald H.; Charles M. Grisham (2002). Principles of Biochemistry with a Human Focus. USA: Brooks/Cole, Thomson Learning. pp. 578, 585. ISBN 978-0-03-097369-7. ^ a b Nuttall FQ, Ngo A, Gannon MC (2008). "Regulation of hepatic glucose production and the role of gluconeogenesis in humans: is the rate of gluconeogenesis constant?". Diabetes/metabolism Research and Reviews. 24 (6): 438–58. doi:10.1002/dmrr.863. PMID 18561209. ^ a b Katz J, Tayek JA (1998). "Gluconeogenesis and the Cori cycle in 12-, 20-, and 40-h-fasted humans". American Journal of Physiology. 275 (3 Pt 1): E537–42. PMID 9725823. ^ a b de Figueiredo LF, Schuster S, Kaleta C, Fell DA (2009). "Can sugars be produced from fatty acids? A test case for pathway analysis tools". Bioinformatics. 25 (1): 152–58. doi:10.1093/bioinformatics/btn621. PMID 19117076. ^ Liu F, Thatcher JD, Barral JM, Epstein HF (1995). "Bifunctional glyoxylate cycle protein of Caenorhabditis elegans: a developmentally regulated protein of intestine and muscle". Developmental Biology. 169 (2): 399–414. doi:10.1006/dbio.1995.1156. PMID 7781887. ^ Kondrashov FA, Koonin EV, Morgunov IG, Finogenova TV, Kondrashova MN (2006). "Evolution of glyoxylate cycle enzymes in Metazoa: evidence of multiple horizontal transfer events and pseudogene formation". Biology Direct. 1: 31. doi:10.1186/1745-6150-1-31. PMC 1630690. PMID 17059607. ^ Weinman EO, Strisower EH, Chaikoff IL (1957). "Conversion of fatty acids to carbohydrate: application of isotopes to this problem and role of the Krebs cycle as a synthetic pathway". Physiol. Rev. 37 (2): 252–72. doi:10.1152/physrev.1957.37.2.252. PMID 13441426. ^ a b Glew RH (2010). "You can get there from here: acetone, anionic ketones and even-carbon fatty acids can provide substrates for gluconeogenesis". Niger J Physiol Sci. 25 (1): 2–4. PMID 22314896. ^ Miller ON, Bazzano G; Bazzano (1965). "Propanediol metabolism and its relation to lactic acid metabolism". Ann NY Acad Sci. 119 (3): 957–73. Bibcode:1965NYASA.119..957M. doi:10.1111/j.1749-6632.1965.tb47455.x. PMID 4285478. ^ Ruddick JA (1972). "Toxicology, metabolism, and biochemistry of 1,2-propanediol". Toxicol Appl Pharmacol. 21 (1): 102–11. doi:10.1016/0041-008X(72)90032-4. PMID 4553872. ^ a b Widmaier, Eric (2006). Vander's Human Physiology. McGraw Hill. p. 96. ISBN 978-0-07-282741-5. ^ a b Mithieux G, Rajas F, Gautier-Stein A (2004). "A novel role for glucose 6-phosphatase in the small intestine in the control of glucose homeostasis". The Journal of Biological Chemistry. 279 (43): 44231–38. doi:10.1074/jbc.R400011200. PMID 15302872. ^ Yip J, Geng X, Shen J, Ding Y (2017). "Cerebral Gluconeogenesis and Diseases". Frontiers in Pharmacology. 7: 521. doi:10.3389/fphar.2016.00521. PMC 5209353. PMID 28101056. ^ Gerich JE (2010). "Role of the kidney in normal glucose homeostasis and in the hyperglycaemia of diabetes mellitus: Therapeutic implications". Diabetic Medicine. 27 (2): 136–142. doi:10.1111/j.1464-5491.2009.02894.x. PMC 4232006. PMID 20546255. ^ Overton, T. R., J. K. Drackley, C. J. Ottemann-Abbamonte, A. D. Beaulieu, L. S. Emmert and J. H. Clark. 1999. Substrate utilization for hepatic gluconeogenesis is altered by increased glucose demand in ruminants. J. Anim. Sci. 77: 1940–51. ^ Donkin, S. S. and L. E. Armentano. 1995. Insulin and glucagon regulation of gluconeogenesis in preruminating and ruminating bovine. J. Anim. Sci. 73: 546–51. ^ Donkin SS, Armentano LE (1995). "Insulin and glucagon regulation of gluconeogenesis in preruminating and ruminating bovine". J. Anim. Sci. 73 (2): 546–51. doi:10.2527/1995.732546x. PMID 7601789. ^ a b c d Voet, Donald; Judith Voet; Charlotte Pratt (2008). Fundamentals of Biochemistry. John Wiley & Sons Inc. p. 556. ISBN 978-0-470-12930-2. ^ Chakravarty K, Cassuto H, Reshef L, Hanson RW (2005). "Factors that control the tissue-specific transcription of the gene for phosphoenolpyruvate carboxykinase-C". Crit. Rev. Biochem. Mol. Biol. 40 (3): 129–54. doi:10.1080/10409230590935479. PMID 15917397. ^ He, Ling; Sabet, Amin; Djedjos, Stephen; Miller, Ryan; Sun, Xiaojian; Hussain, Mehboob A.; Radovick, Sally; Wondisford, Fredric E. (2009-05-15). "Metformin and Insulin Suppress Hepatic Gluconeogenesis through Phosphorylation of CREB Binding Protein". Cell. 137 (4): 635–646. doi:10.1016/j.cell.2009.03.016. ISSN 0092-8674. PMC 2775562. PMID 19450513. ^ Hatting, Maximilian; Tavares, Clint D.J. ; Sharabi, Kfir; Rines, Amy K.; Puigserver, Pere (2017-09-03). "Insulin regulation of gluconeogenesis". Annals of the New York Academy of Sciences. 1411 (1): 21–35. doi:10.1111/nyas.13435. ISSN 0077-8923. PMC 5927596. PMID 28868790. ^ Wang Y, Tang H, Ji X, Zhang Y, Xu W, Yang X, Deng R, Liu Y, Li F, Wang X, Zhou L (2018). "Expression profile analysis of long non-coding RNAs involved in the metformin-inhibited gluconeogenesis of primary mouse hepatocytes". International Journal of Molecular Medicine. 41 (1): 302–310. doi:10.3892/ijmm.2017.3243. PMC 5746302. PMID 29115403. ^ Mutel E, Gautier-Stein A, Abdul-Wahed A, Amigó-Correig M, Zitoun C, Stefanutti A, Houberdon I, Tourette JA, Mithieux G, Rajas F (2011). "Control of blood glucose in the absence of hepatic glucose production during prolonged fasting in mice: induction of renal and intestinal gluconeogenesis by glucagon". Diabetes. 60 (12): 3121–31. doi:10.2337/db11-0571. PMC 3219939. PMID 22013018.